I have been very busy preparing for the Hidden Valley Country Club Holiday Boutique. It will be held tomorrow, the 15th, from 2 to 8 pm. 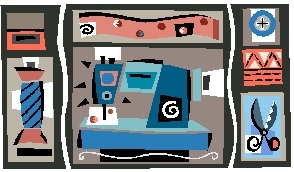 My sewing machine has been sputtering after all these weeks of work! The Bernina and I will need a few days of vacation, away from each other! Table runners, mats, stockings, napkins, stuffed animals, purses... Ai, ai, ai... No wonder I have posted fewer comments lately. Keep me in your thoughts and wish me Happy Selling!